Can you think of technological breakthroughs that had huge impacts on the world of sports? 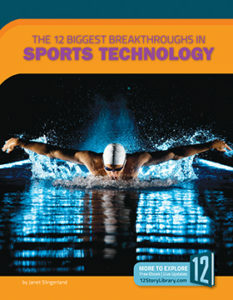 From the images that capture sports and athletes on film to the clothing athletes wear, this book covers the 12 technological advancements that had the biggest impacts on sports and athletes. Did you ever wonder what scientists and engineers have to do with sports and athletes? 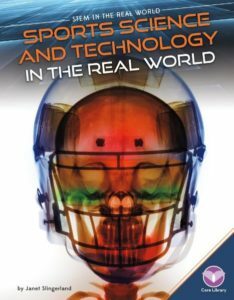 Sports Science and Technology in the Real World looks at some of the STEM careers related to sports. ABDO BookLinks has a page for Sports Science and Technology in the Real World. It provides some web site links related to the book. History.com has info and videos on Winter Olympics Technology. NBC Learn, partnered with the National Science Foundation (NSF) has lots of videos on various sports science topics, including the Science of NFL Football, the Science of Golf, the Science of NHL Hockey, and Science and Engineering in the 2014 Winter Olympics. There are more great science videos related to sports and other topics, so have fun exploring! Sports scientists are doing some interesting research at Biosport, the Sports Biomechanics Lab at UC Davis. Things they are studying include luge and bobsled safety, balance and control on a bicycle, equine (horse) biomechanics, and more. There are videos and explanations for a lot of these topics. Check it out. The Sports Science Lab at Washington State University specializes in baseball bats and balls. If you're interested in baseball and/or physics, check it out.